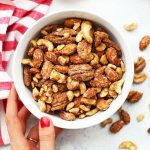 My Favorite Spiced Nuts – These naturally sweetened candied nuts have just the right hint of spice. They’re perfect for parties, appetizers, treats, and gifting! 2 cups raw nuts (I do 2/3 cup almonds, 2/3 cup cashews, and 2/3 cup pecans)* See notes! Line a baking sheet with a parchment paper or a nonstick silicone baking mat. Set aside. Add nuts, spice, and syrup to a medium saucepan. Stir to combine. Immediately, transfer the candied spiced nuts to your prepared baking sheet and spread out in a single layer. Sprinkle with a pinch of salt and allow to cool completely before storing or eating. To store, transfer to an airtight container and keep in the refrigerator for best results. Nuts will keep up to 1 week in the refrigerator, or 2-3 days at room temperature.